Warren Brock, communications manager with UBC’s Faculty of Medicine Southern Medical Program, leads an on-line information session with students in the South Okanagan, demonstrating UBC’s videoconference technology as a way of delivering lessons across the province. 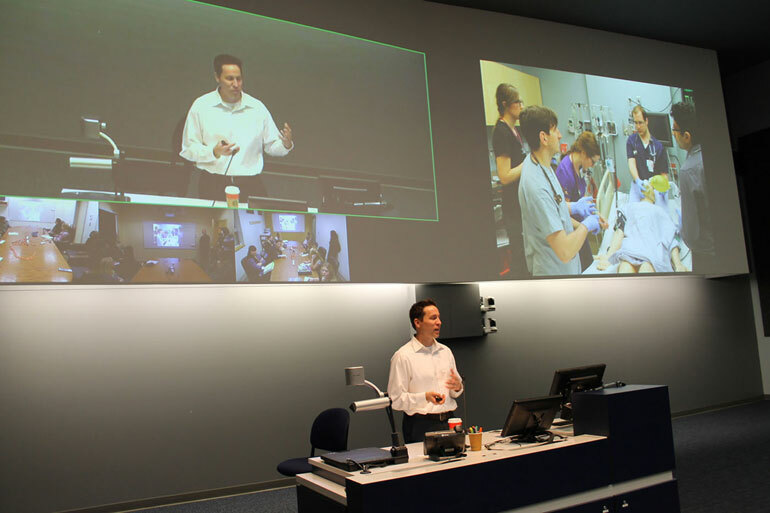 UBC has long used videoconference technology to train its medical students. In a unique move, the Faculty of Medicine’s admission office decided to use the same technology as a recruitment tool — offering its first-ever virtual info session to students in the South Okanagan via the Kelowna campus. Dr. Bruce Fleming, associate dean, Admissions for the Faculty of Medicine says the technology plays a critical role in the delivery of academic sessions and connecting students, faculty, and staff across its four academic campuses and 100-plus clinical teaching sites throughout the province. This technology is now being used to connect remotely with prospective medical students in small or rural communities. In an innovative approach, students from Penticton, Princess Margaret, and Summerland Secondary Schools recently participated in a medical admission information videoconference from a lecture theatre at UBC Okanagan. “While there is no shortage of applicants, there is a continued focus on increasing the number of northern and rural students and those from remote communities admitted to our program,” says Fleming, explaining that the admissions office sees roughly 2,000 applications to the program each year. In collaboration with career counsellors and staff from School District 67, the event was led by Warren Brock, Southern Medical Program communications manager. Brock says the session focuses on what medical school is all about, the diverse scope of medical practice, and at the same time, works to dispel common admissions myths such as seeking only straight-A science students. Christina Mitchell, a Grade 12 Penticton student, admits that applying to medical school is daunting at first with so many unknowns. The admissions office is now exploring the potential to host more of these sessions for other academic institutions and school districts across the province.